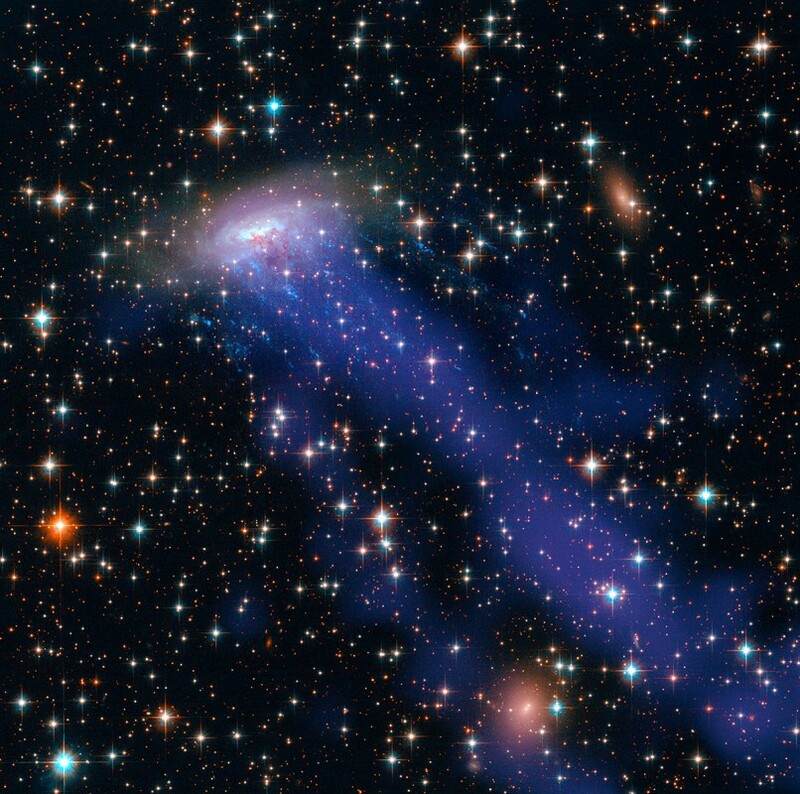 To me it looks like a jet, being violently ejected by energetic processes in the galaxy's core. Apparently that is not the case. The explanation in the caption is good enough. The red path connects to the center of D100 because the outer gas, gravitationally held less strongly, has already been stripped away by ram pressure. For me the "Galaxy gas stripping" is new phenomena. How can it happen? Is not so clear to me, If I don't assume the galaxy itself as running inside a "mega -storm" which involves the whole galaxy itself. Galaxy ram stripping is a relatively common phenomenon. It occurs when gas-rich galaxies get caught up by the mighty gravity of fairly nearby galaxy clusters. 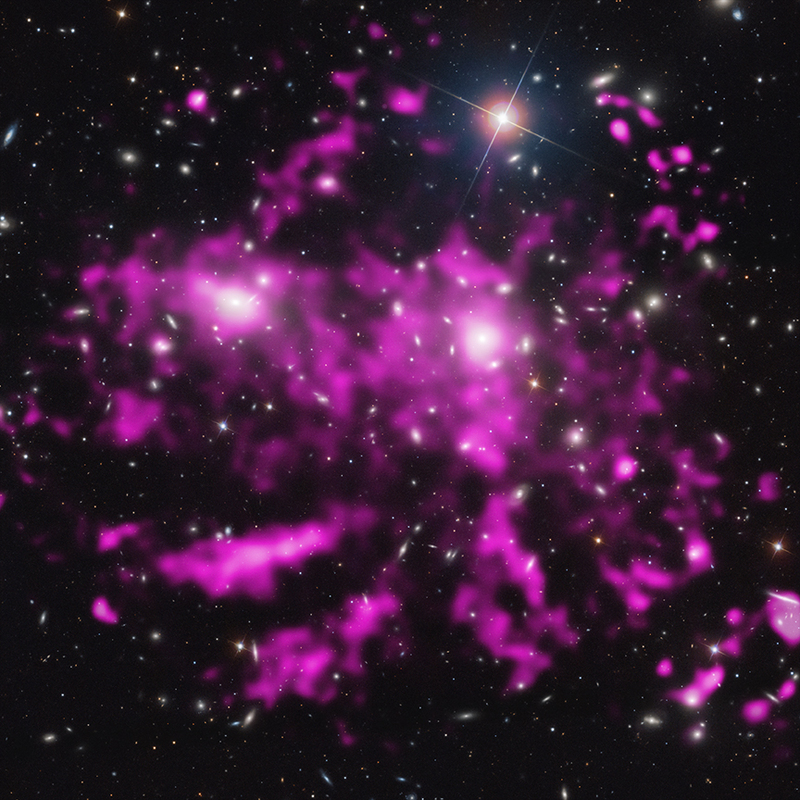 Such clusters are always full of thin, multi-million degree gas, which fills the space between the member galaxies. Because this gas is so hot, it can only be seen at X-ray wavelengths. The picture at left shows the X-ray-emitting hot intracluster gas in a galaxy cluster. When a spiral galaxy falls into the cluster, pulled there by the cluster's overwhelming gravity, the intracluster gas acts as an "upwind" on the spiral galaxy. The spiral can't hold on to its gas, which is pulled out of it in a long tail. You can see that the galaxy in the picture at right, ESO 137-001, is losing gas from most of its disk. Gas being stripped from the core of galaxy D100 in the Coma Cluster. In the case of spiral galaxy D100 in the Coma Cluster, it has, according to today's caption, already lost the gas in its disk. That makes sense to me. Most of the mass in any large galaxy will be concentrated in its core, and the galaxy'a ability to hold on to its own gas will be greatest in its core. In galaxy D100, even the gravity of its core is being overwhelmed by the combined gravity of massive galaxies tugging at the gas in its core. The gas in its disk has already been lost, because the galaxy's own "local gravity" is weaker there. Now the rest of the gas is being pulled out of the galaxy in a long narrow "jet" which isn't generated by upheavals in the galaxy's core, just a concentrated source of gas being pulled out of the galaxy in a long narrow string. What a joy to see this image! Fritz Zwicky discovered many decades ago that the galaxies in Coma were moving so fast there must be tons of dark matter there in addition to the galaxies. Surely it must be ionized hydrogen? But X-ray observations discovered the gas that is causing what you see in the picture, and yet its mass is only one percent of what is needed---we still don't know what the rest is: 'dark matter' we call it. I wonder what becomes of the stars formed within the tail. Will they fall back into D100 or will (have) they become rogues. Imagine living in D99, knowing that once your sun burns its fuel, all the others are gone too, and there's nowhere to go. I remember reading, maybe in Sky and Telescope, and predominantly blue galaxies (intrinsically blue that is, not because of shifting). Wonder what's going on in that case? High resolution composite image, with Chandra X-ray data in pink and optical data from the Sloan Digital Sky Survey appearing in white and blue. <<A team of astronomers has discovered enormous arms of hot gas in the Coma cluster of galaxies by using NASA's Chandra X-ray Observatory and ESA's XMM-Newton. These features, which span at least half a million light years, provide insight into how the Coma cluster has grown through mergers of smaller groups and clusters of galaxies to become one of the largest structures in the Universe held together by gravity. The X-ray emission is from multimillion-degree gas and the optical data shows galaxies in the Coma Cluster, which contain only about 1/6 the mass in hot gas. Only the brightest X-ray emission is shown here, to emphasize the arms, but the hot gas is present over the entire field of view. Researchers think that these arms were most likely formed when smaller galaxy clusters had their gas stripped away by the head wind created by the motion of the cluster through the hot gas. From their length, and the speed of sound in the hot gas (~1,100 km/s), the newly discovered X-ray arms are estimated to be about 300 million years old, and they appear to have a rather smooth shape. This gives researchers some clues about the conditions of the hot gas in Coma. Most theoretical models expect that mergers between clusters like those in Coma will produce strong turbulence, like ocean water that has been churned by many passing ships. Instead, the smooth shape of these lengthy arms points to a rather calm setting for the hot gas in the Coma cluster, even after many mergers. Large-scale magnetic fields are likely responsible for the small amount of turbulence that is present in Coma. What happens to the galaxies that fall to the center of the cluster completely stripped of their gases? Do they just snuff out and die, or break up and attract matter from other spent galaxies? The astronomer should not use the present tense in describing astronomical phenomena. This all happened millions or billions of years ago. 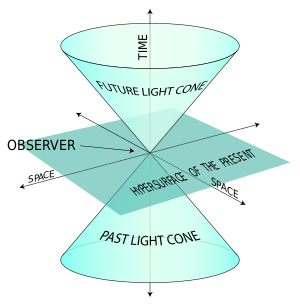 Everyone's perception of the outside world lies on the Past Light Cone. Astronomers discuss events on the Past Light Cone as having occurred in the past only when it's helpful in making a particular point (; e.g., conditions were different back then). Well, first they become "anemic galaxies". They retain their spiral structure, but they lose more and more of their gas. As the gas disappears, the dust lanes become weaker, and fewer and fewer stars can be formed. Then they become those boring yellow blobs called elliptical galaxies. When they have lost their gas, they lose most of their structure, and the young blue stars turn yellow with age. These galaxies can't make new stars, or at least, their starforming ability is extremely low. And if they come too close to another galaxy, they may merge with it and "disappear". This explanation, of hot gas stripping away the galaxy's hydrogen, makes little sense to me. Can I play a bit of a devil's advocate on this one? The only mental image I can construct for it, would, as distefanom pointed out, result in a more chaotic structure. I would add to that, that I would expect a wider cylinder, and the loss of material out of the "back" should be countered by build-up of material on the "front". Ann's 2nd image, of ESO 137-001, looks more like it. The disk of the galaxy should be bowed, like that of NGC 4402. There should also be bleeding of dust, on a shorter scale. Perhaps imagery in other bandwidths would help make this conclusion more believable. Why would D100 have a tail and D99 have none? Perhaps you can say "D99 is older, its gas was already stripped and is now no longer visible." If so, where are the stars it left in its wake? 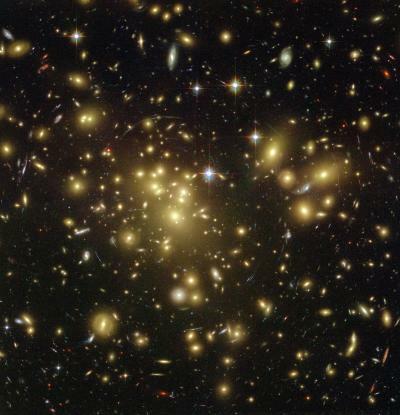 There are thousands of galaxies in a Coma Cluster. If this is a "thing", there should be tails like this for quite a few of them. And these tails should bolster the conclusion by all pointing away from the motion of the galaxy from which they emanate. Maybe there is such evidence that has already been gathered. Maybe there is a survey that has just begun. I don't know. I assume that at least for anyone to have believed this hypothesis, this tail is in the opposite direction of D100's motion towards the cluster center. Is there any way to verify that? A quote from the Hubblesite http://hubblesite.org/image/4285/gallery says: "This can be strong enough to tear galaxies apart, and often results in objects with peculiar, bizarre shapes and features — as seen here." What I'm wondering about is the word "often" in this description. I'd love to see more examples. This explanation, of hot gas stripping away the galaxy's hydrogen, makes little sense to me. The only mental image I can construct for it, would, as distefanom pointed out, result in a more chaotic structure. I would add to that, that I would expect a wider cylinder, and the loss of material out of the "back" should be countered by build-up of material on the "front". <<In the massive Coma cluster, this violent gas-loss process occurs in many galaxies. But D100 is unique. 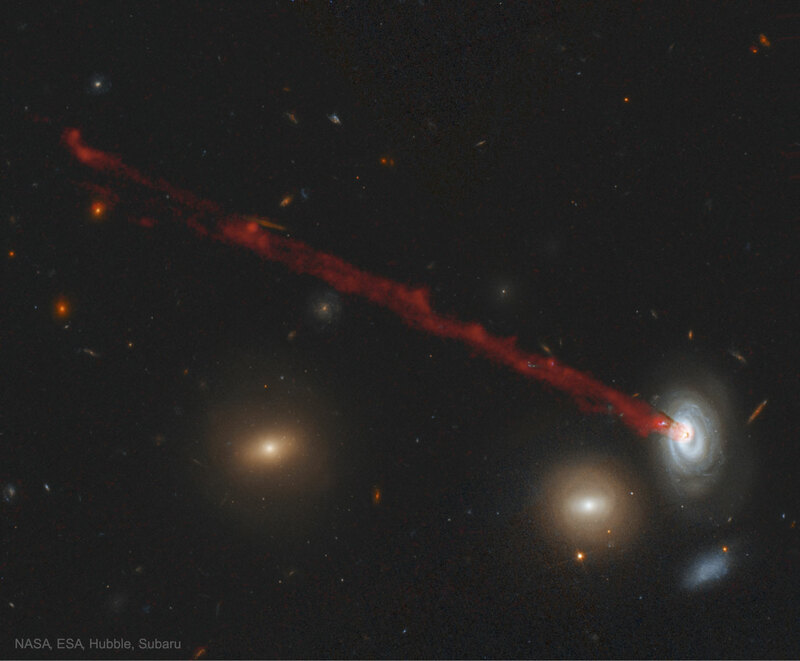 Its long, thin tail, for example, extends nearly 200,000 light-years — about the length of two Milky Way galaxies. In addition, the tail is narrow, only 7,000 light-years wide. Why would D100 have a tail and D99 have none? Perhaps you can say "D99 is older, its gas was already stripped and is now no longer visible." If so, where are the stars it left in its wake? D99 is older, its gas was already stripped and is now no longer visible. The stars are like pasties that remain after the gas-stripping is complete. I assume that at least for anyone to have believed this hypothesis, this tail is in the opposite direction of D100's motion towards the cluster center. Is there any way to verify that? D100 should attain it's fastest velocity through the densest part of the cluster's hot gas when it is actually at the center of the cluster so I assume that they already know that has yet to reach that point by having located D100 vs-a-vis the center of the cluster. Star formation appears to have ceased in the outer part of D100's disk, but you can still see spiral arms closer in, and that means it still has gas there, closer to the center. Eventually that too will be blown out; the whole process of cleaning out a galaxy takes roughly a billion years. It has further persuaded me of the reasonableness of the claims in today's APOD. In addition to many detailed observations of the tail, much like the point made above, they also mentioned that lots of tails have been observed in the Coma cluster, something like "20 and counting". One of their points is that they believe the galaxy is actually not moving through the intra-cluster medium perpendicular to its plane, which would have been my first guess at looking at the APOD image. Instead, they think it is moving at an angle that is significantly edge-on through the medium, and we are not looking perpendicularly to that tail. An interesting side-point, which I readily accept, is that looking at this tail where it meets the galaxy disk of D100 reveals that the left edge of D100 is the remote edge. That's kind of handy, I think it can sometimes be very hard to tell which is the farther edge.